Biman Bangladesh Airlines has significantly improved its position as it nears the finishing line in its long overdue fleet renewal programme. But the carrier continues to face several challenges and will need network and strategic adjustments if it is to complete a turnaround. Biman added four 777s in 1Q2014, allowing it finally to phase out its ageing DC-10 fleet. The flag carrier plans to complete the renewal of its fleet in 2015 as it takes two new 737-800s, enabling the phase out of its ageing A310 fleet. Biman is now looking at potentially leasing two more 777s in 2015, which would be used to launch services to New York. Sydney is also under consideration but network adjustments including the possible suspension of Frankfurt would be necessary. Biman will also need to leverage its improved product to boost yields and attract partners. Biman is one of Asia’s smallest flag carriers, operating only 10 aircraft on a network of 22 destinations, including 19 international and three within Bangladesh. Its fleet currently consists of four 777-300ERs, two 777-200ERs, two 737-800s and two A310s. A few years ago Biman had one of the oldest fleets in Asia – an eclectic mix of A310s, DC-10s, 747-200s and Fokker 28s. The resurgence began in late 2011 as the first two 777-300ERs from a 2008 four-aircraft order were delivered. The final two 777-300ERs were delivered in 1Q2014. As the four additional 777s entered the fleet, Biman was able to retire its last batch of DC-10s. Biman had operated DC-10s since 1983 and was the last carrier to still have passenger DC-10s in service. Biman also placed orders in 2008 for four 787-8s. But the 787s are not slated to be delivered until 2019. For now Biman expects to use the 787s for a combination of replacement and growth. The 787s will be delivered about the time its two 777-200ERs are due to be returned to EgyptAir. Biman began renewing its short-haul fleet in early 2010 by dry leasing two used 737-800s, which are currently about 13 years old. Biman also ordered two 737-800s in mid-2008 (at about the same time it ordered its 777-300ERs) and will finally take these aircraft in 2015. The carrier will phase out its remaining two A310s as the two additional 737-800s enter. Biman has been operating A310s since 1986. 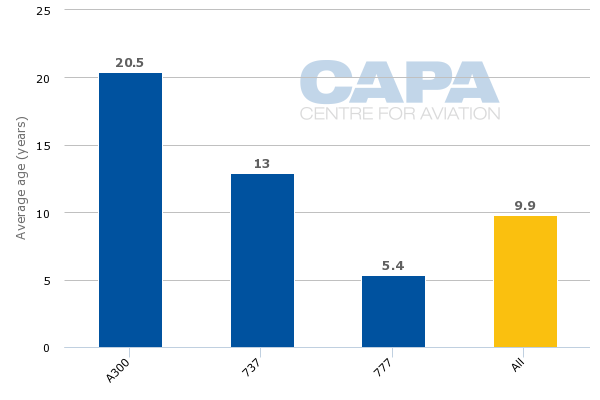 Its two remaining A310s have an average age of just over 20 years while its 777s have an average age of just over five years, according to the CAPA Fleet Database. Once the A310s are out of the fleet, six of Biman’s 10 aircraft will be less than four years old and the other four aircraft will be a respectable 14 years old. In comparison three years ago every Biman aircraft was at least 20 years old with the exception of two 10-year old 737-800s. For now Biman’s fleet will stay steady at 10 units as the two aircraft it has so far committed to adding in 2015, new 737-800s, will replace two A310s. But the carrier is now considering dry leasing two additional 777-200ERs in 2015 which would be used for expansion of its long-haul network. Biman also has been looking to lease two additional 737-800s from early 2015. But these aircraft would not likely be used for growth and would instead be used to replace its two existing older model 737-800s, which were leased from GECAS in early 2010 for a period of five years. Tender documents for the two additional leased 737-800s state that Biman will only consider aircraft that are less than 10 years old. Biman also has been seeking to lease two 70-seat turboprops, which could be delivered in late 2014 or 2015. The new turboprops would allow for expansion of the domestic operation, which has been reduced to just two routes and less than 10,000 weekly domestic seats. Biman had a larger share of the domestic market prior to the phase out of its Fokker 28s in 2012. Biman’s position in the domestic market and the position of its local competitors will be analysed in the second of this two part series of analysis reports on the Bangladeshi market. This part looks specifically at Biman’s outlook in the international market. The transition from the DC-10 to 777 should significantly improve Biman’s position in the international market. The 777 is significantly more efficient, resulting in lower operating costs. It is also a larger aircraft, allowing Biman to increase capacity without adding frequencies, and has a much improved cabin product. There have been significant improvements over the last year in Biman’s reliability (i.e. on-time performance) and service standards – both of which have notoriously been very poor. Biman is now mainly operating 777s to Europe and the Middle East. According to OAG data, 10 of Biman’s 19 international destinations including seven of eight destinations in the Middle East and all three in Europe are now served entirely by 777s – Abu Dhabi, Dammam, Doha, Dubai, Jeddah, Muscat and Riyadh in the Middle East and Frankfurt, London and Rome in Europe. Kuala Lumpur in Malaysia also primarily sees the 777, with six weekly 777 frequencies and one weekly A310 frequency. Biman’s seven other Asian international destinations see a mix of 737-800s and A310s. Bangkok, Delhi, Kathmandu, Kolkata and Yangon are currently entirely operated with 737-800s while Hong Kong sees entirely A310s and Singapore a mix of 737-800s and A310s. One of the carrier’s eight Middle Eastern destinations, Kuwait, is also currently operated with A310s. Kuala Lumpur, which is a huge market for Bangladeshi labour workers, is currently Biman’s largest destination (and Dhaka’s largest destination overall) based on seat capacity. Chittagong to Abu Dhabi and Dhaka to Riyadh, Kathmandu and Kolkata are also among its largest five international routes. While Biman expects the transition from the DC-10 to 777 will over time improve its profitability and yields the carrier has not yet noticed any positive trends. Biman acting CEO and MD Mosaddique Ahmed told CAPA the product improvement has been noticed by passengers but they have not resulted yet in an improvement in the carrier’s yields, which are generally low, or premium traffic. “That will take slightly more time,” Mr Mosaddique says. Biman is keen to woo back business passengers, who now predominately fly on foreign carriers. But while the 777 marks a huge improvement over the DC-10, Biman’s business class seats on all its 777s are 160 degree angled-flat rather than full lie-flat. For now Biman’s traffic continues to predominantly consist of migrant workers. This is a very price sensitive segment with tickets generally being purchased by labour contractors expecting big discounts in exchange for high volumes. Biman will need to change its passenger mix for its investment in new aircraft to be converted into higher revenues. The carrier will particularly need to up its game in the business and corporate travel segment on its 777-300ER routes as it has configured its 777-300ERs with 35 business class seats (along with 385 seats in economy). The smaller 777-200ER has only 12 business class seats (and 307 seats in economy), a more appropriate mix given Biman’s routes. The carrier’s 737-800s also have 12 business class seats compared to the 24 on the A310s that will be replaced. Wooing over business class passengers however will not be easy as there are several premium carriers serving the Bangladeshi market. The Gulf carriers are particularly fierce competitors, pricing aggressively for labour traffic at the back while using their high standard premium product to attract business passengers heading to or from the Middle East, Europe, Africa and the Americas. Emirates is the largest foreign full-service carrier in the Bangladeshi market, with about 10,000 weekly seats and 16 weekly return frequencies, while Qatar Airways is third largest with about 6,600 seats and 20 frequencies. Etihad has 5,550 seats and 10 frequencies, making it the fifth largest international full-service carrier in the Bangladeshi market. In the Bangladesh-Asia market, Biman competes with leading Asian full-service carriers including Cathay Pacific Airways, Malaysia Airlines (MAS), Singapore Airlines and Thai Airways. MAS is the second largest full-service carrier in the international Bangladesh market, with three daily flights and about a 7% share of total international seat capacity. 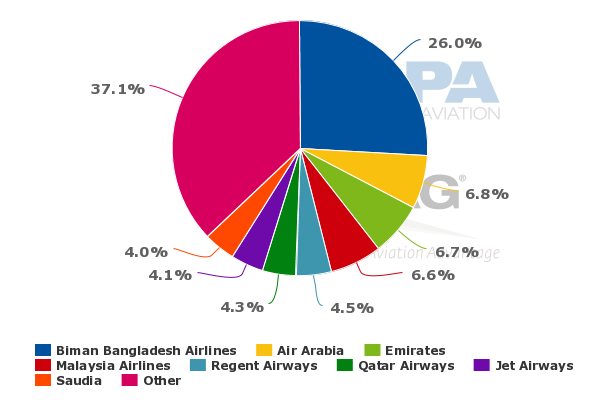 Emirates also has about a 7% share while Biman has a leading but far from dominant 26% share, according to CAPA and OAG data. Biman also faces LCC competition to Southeast Asia and the Middle East. LCCs currently account for about 15% of total international seat capacity in Bangladesh. Five of the 26 foreign carriers currently serving Bangladesh are LCCs, with Sharjah-based Air Arabia by far the largest (with 32 weekly return frequencies). Bangladesh is also served by flydubai, Malindo, Mihin Lanka and Tigerair (but no Indian LCC). Biman has been consistently unprofitable for the last several years. While losses have narrowed in recent years the carrier says it still incurred a loss of about USD20 million in its last financial year (despite only carrying 1.5 million passengers). Mr Mosaddique says Biman’s financials have not improved in the current financial year despite the phase out of the DC-10s because the Bangladesh-Middle East market has been challenging as a result of a slowdown in Bangladeshi worker traffic. “So far we have been completely dependent on Bangladeshi workforce spread out all over the world. We have been too dependent on them but the Middle East market for the Bangladeshi worker I believe is shrinking a bit,” he says. 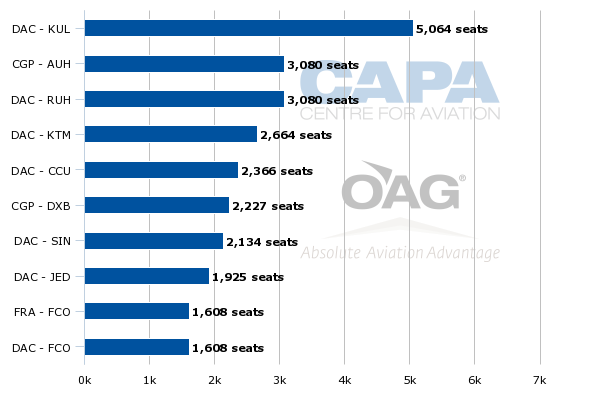 The Middle East currently accounts for 49% of Biman’s seat capacity compared to 38% for Asia and only 13% for Europe, according to CAPA and OAG data. Asia capacity will likely be reduced slightly in 2015 as A310s are replaced by smaller 737-800s. But Biman expects to slightly increase capacity to Europe by adding more frequencies to London. Europe would also see more capacity if Biman launches service to New York, which would be served via the UK. Biman currently only operates five weekly flights to Europe, including three to London Heathrow and two to Rome which continue onto Frankfurt. Biman director of marketing and sales Mohammad Shah Newaz told CAPA the carrier is aiming to increase London to five weekly flights. The additional capacity to London can be accommodated using the existing fleet of six 777s. London is Biman’s main market as the UK has a large Bangladeshi community. Rome, which was increased from one to two weekly frequencies earlier this year, is the carrier’s main market in continental Europe as Italy also has a large Bangladeshi community. Frankfurt, which was resumed in late Mar-2014 after a hiatus of several years, has struggled in the first three months. Biman is now trying to improve its Frankfurt performance by focusing on connections at both ends. The airline is committed to continue serving Frankfurt for another several months with the hope it is able to improve performance. Biman is now focussing on using Frankfurt for offline destinations in Europe but has to rely on interlines as it does not currently have any codeshare partners. Biman is also trying to promote in the Frankfurt market connections beyond Dhaka, in particular to Bangkok and Kathmandu. But these are intensely competitive and low yielding markets. Currently transit accounts for less than 10% of Biman’s total traffic. This is not a segment it can easily grow. Trying to boost Frankfurt loads by pushing Bangkok or Kathmandu is not a sustainable long-term solution. Ultimately Biman may have to pull the plug on Frankfurt. This could be a decision for Biman’s still to be appointed new CEO. The carrier recently short-listed several potential candidates. Mr Mosaddique, who was already on Biman’s board, stepped in as temporarily CEO in Apr-2014 following the resignation of Kevin Steele for medical reasons. Mr Newaz says Bangladeshi authorities are now hoping to be upgraded to Category 1 by the end of 2014, which would allow Biman to launch services to New York in early 2015. He says if Category 1 is secured Biman plans to source two additional 777-200ERs as it does not believe it currently has sufficient widebody capacity to launch services to the US. A second destination in the UK is also contingent on Category 1 (and two additional 777-200ERs) as Biman does not think Birmingham or Manchester can be viable on their own. Biman initially selected Birmingham last year as the stopover for its planned service to New York. Biman has pick up rights at Birmingham, which is keen to secure Biman, as the airport currently does not have any non-stop service to New York. Manchester is also an option for Biman. The carrier was planning to resume services to Manchester this year but has postponed the new route. If New York is pursued in 2015, the stopover point could be reviewed and potentially switched from Birmingham to Manchester. Both cities have sizeable Bangladeshi populations. Ultimately the New York plan and the possible lease of two additional 777s will come under review by the new management team. With Biman not yet noticing a financial improvement from the DC-10 to 777 transition, delaying further expansion of the 777 fleet and network could be anticipated. The business plan under Mr Steele was extremely ambitious and envisioned several new long-haul destinations including Los Angeles. Expansion in Asia, particularly mainland China, was also on the cards. Biman could do better to focus on its core international markets and forge partnerships to expand its network virtually. New partners could potentially improve Biman’s offline access to North America, making a one-stop product to New York, Los Angeles and Toronto unnecessary. Biman currently does not have any codeshares. But its improved product, service and reliability should help it attract partners. Access to Europe beyond the key destinations of Rome and London as well as to North America could be improved by working with a European or Gulf carrier (or multiple carriers). A partnership with an Asian carrier could provide access to more points in Asia-Pacific, including Australia, and the west coast of North America. Biman has Australia in its long-term business plan but New York is the first priority and working with a Southeast Asian carrier to serve Australia could be a more practical approach. Biman has come a long way the last few years as badly needed fleet renewal has ushered in product and service improvements. The carrier, and its government shareholder, now faces a critical juncture as it needs to decide whether to pursue growth, which would help put Biman back on the global map but comes with risk. Biman has an improved outlook and a potentially sustainable future as a niche carrier. But there are still huge challenges to overcome. A full turnaround and profitability is far from certain.